I tell the residents: "The pacemaker is just common sense: if there is no beat, it provides one; if there is one, it keeps itself from pacing." "What would I do if I were a pacemaker?" Dual means that this occurs in both the atrium and the ventricle. 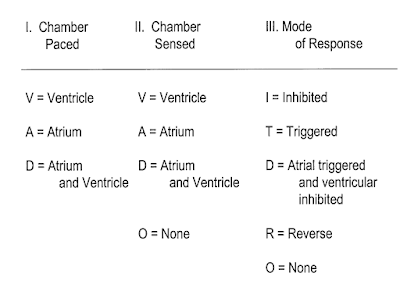 As you can see from the chart below, a VVI pacer is ventricle only and cannot be triggered by an atrial beat. It can only be inhibited by an intrinsic ventricular beat. So a DDD pacer can pace the atrium (if needed), then wait a defined period (e.g., 200 ms, like a PR interval) and pace the ventricle (if needed). 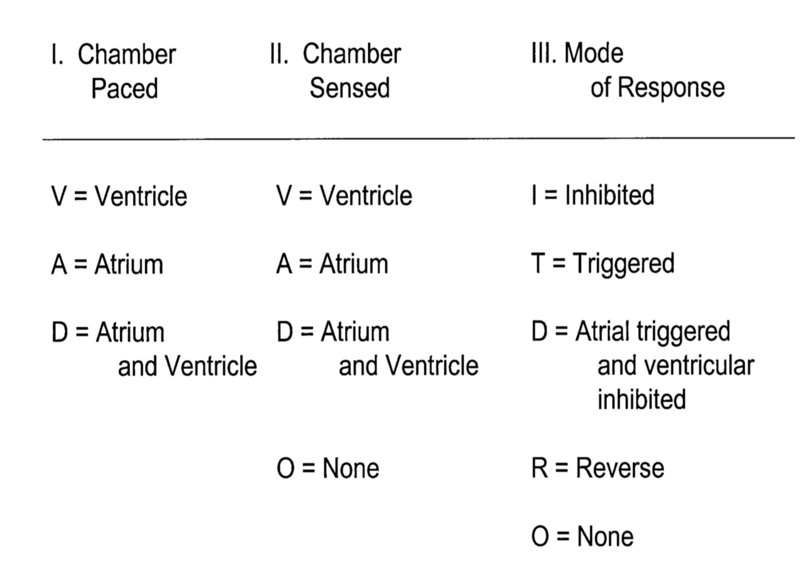 Either or both functions can be inhibited if the atrium or ventricle (or both) fires before the interval passes. One of the reasons I'm presenting this case is that several residents misunderstood the concept of "failure to sense," believing it to be a cause of absence of pacing. This made me realize that pacemaker function is not as well understood as I thought. In fact, when a pacemaker fails to generate an impulse (fails to pace), one reason may be oversensing, not undersensing. This is why we use a magnet when there is failure to pace! To stop oversensing and thus stop inhibtion of pacing. The magnet turns off the sensing function and the pacer becomes "asynchronous," meaning it will fire at a regular rate regardless of the intrinsic activity of the heart. We place the magnet because a failure to pace may be due to oversensing (not undersensing) with inappropriate inhibition of pacing. A patient called 911 for weakness. She had recently had a DDD pacemaker placed. Her prehospital ECG showed failure to pace by the internal pacer. External pacing was attempted but not tolerated and, because the patient was only mildly hypoperfused, she was transported to the ED without further intervention. Exam revealed a fresh surgical scar at the area of pacemaker placement with significant swelling due to hematoma at the site of insertion. Try to figure it out before reading the explanation below. So what is happening here? Failure to capture. There may also be failure to sense, but it is not having any effect. Black arrows show P-waves marching out regularly at a rate greater than 100. They are not conducting at all (complete AV block) and thus are not affecting the ventricles at all. The fact that the sinus node is tachycardic tells us that the sinus node is probably "trying" (teleologically speaking) to compensate for inadequate cardiac output. Green arrows show ventricular pacer spikes. These spikes come at a fixed interval (200 ms) after every P-wave. Therefore, the atrial pacing lead must be sensing the sinus activity and P-wave. The ventricular pacer is programmed to fire at a fixed time period after the P-wave in order to synchronize atrial and ventricular activity. If the ventricle had depolarized on its own (had there been no AV block), AND the ventricular sensing function also sensed the depolarization, then there would be no ventricular pacing spike. However, the pacer is clearly not capturing the ventricle (not resulting in depolarization of myocardium, so no QRS). There are 2 pacer spikes which are missing (between 3rd and 4th arrows and between 6th and 7th). They may be there and hard to see (hidden); alternatively, they are not there at all. If the spikes did not happen at all, that would be a result of the pacer sensing the QRS, resulting in inhibition of pacing [even if it cannot pace (cannot capture)]. This would be unusual, as when the pacer lead is able to sense it is also usually able to pace. Red arrows show escape beats at regular intervals, which in lead II (across the bottom) appear narrow, but if you look up at the leads above, especially at V1 above the 3rd escape beat, you see that it is RBBB morphology and therefore is an escape from the left ventricle (an escape from the junction or bundle of His, along with RBBB, would have the same morphology but at a faster rate). The T-wave of the third escape beat is larger than the others because of a coincidentally superimposed P-wave. The Dark Blue Arrow points to a pacing spike that occurs directly at the onset of a QRS, but that QRS looks exactly like those of the escape beat. Therefore, it is just a coincidence that it happened at the same time as the onset of the QRS. It is not capturing and not resulting in a QRS. The Light Blue Arrows point to pacing spikes that are followed immediately by wide beats (see brown arrows) that are typical of paced beats and different from the escape beats. These are beats in which the pacer captured. The potassium was normal, there was no ischemia or drug toxicity. She went for emergent pacemaker revision. It turned out that the hematoma at the "pocket" of the pacemaker had displaced the pacemaker, pulling the ventricular lead out of position. This was fixed. 3. Magnet application if no pacer spikes. 6. Chronotropic support with Isoproterenol, Epinephrine, or Dopamine to increase ventricular escape rate. Great case as always, I just thought I'd share my very simple interpretation of some of the issues seen with PPMs. Sensing is about how many spikes are there and how many should there be. Capture is about what is the effect of the spike. Under-sensing = Over pacing (more spike that you'd anticipate, reduced / lack of inhibition from native cardiac activity). NEXT — Remembering that most of the time, these amazing devices (pacemakers) are appropriately performing what they have been programmed to do — so our task as ECG interpreters is often best served by assuming the pacemaker is probably correct, and trying to figure out WHY the pacer is acting as it is. The above said — this case clearly is one in which the pacemaker is not functioning correctly. As is superbly illustrated and explained by Dr. Smith — the pacemaker IS sensing spontaneous atrial activity — and IS appropriately putting out pacer spikes — but for the most part, is not capturing the ventricles. There is no way this pacemaker could be functioning appropriately with an effective ventricular rate in the 20s!